I feel like I say this every week, but honestly. This week was so stressful. Last weekend J got sick, the worst he's been in his young life. His fever got up to 103.5 on Sunday night and I was freaking out. We ran him a bath and gave him Tylenol and thankfully it came down some, or we would have taken him to the hospital. I took him to the pediatrician on Monday, and he tested positive for the FLU. I have decided that having a sick kid is one of the suckiest parts of being a working mom. I very nearly wrote an emotional and pity party-throwing blog post about all the reasons it's terrible and hard, but I came to my senses and realized no one cares and that's annoying. You're welcome. But it IS so hard because I had to figure out childcare for an entire week while feeling extremely guilty for leaving my sick baby with someone else while I went to work. 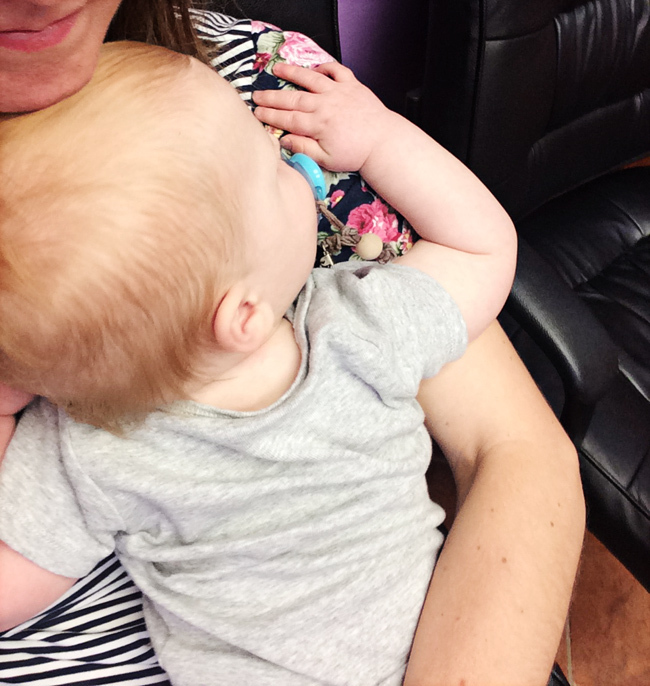 And WHO CARES ABOUT WORK when sweet J is so sad and just wants to snuggle with his mama. Guilt Trip and No Motivation, party for two. But I am super thankful my mother-in-law was available to watch him, and I'm grateful she takes such good care of him. Anyway. J is on the mend finally after living on Tylenol and Motrin for four days straight because it was too late for Tamiflu (which we weren't sure we wanted to give him anyway). Thank you, Jesus! It's kind of the best to see your kid smiling and playing after they've been sick. Warms my heart, and we have a whole weekend of snuggles and playtime ahead! On to some Friday favorites! I am not usually someone who gets compliments on their outfits because, well, I'm just not. But I'm not exaggerating when I say that at least one person comments on this shirt any time I wear it. (I just realized while writing this that I'm wearing it in the photo above! This was not planned. I do love that shirt and wear it a lot, though. ha!) It's from one of my favorite online shops. They have new releases pretty often, and I think they have some really cute stuff (follow them on Instagram and watch for sales!). I have this sweatshirt, which is super comfy and nursing friendly, and I want to wait for a sale and buy it in black. They just released this shirt, which is pretty fun for the pregnant mamas out there! J is turning 10 months old next week, and he maybe might be finally getting a tooth! (Yes, on top of having the flu, I think he is cutting a tooth. RIP, sleep.) We think we see something ready to pop through on the top. When R was teething, I bought these off the recommendation of a blog I follow, and it was a giant fail. She either wanted nothing to do with it, or she couldn't figure out how to hold it without gagging herself (complete user error, not the product). I pulled it out for J earlier this month, and I find no end of amusement out of the fact that he loves it. He hasn't gagged himself once and he gets so excited whenever I hand it to him. Kids are funny. I'm getting really excited about next weekend, which is the annual women's retreat for our church. I have never gone before, and I wasn't sure if I was going to go this time either since I will be gone two days and a night. But I am really excited about the speakers this year--Kay Arthur, Ruth Chou Simons, and Katherine Wolf. I am reading Katherine's book currently, and I am looking forward to hearing from her! I have no idea what being gone from J for this long will do to my quickly dwindling milk supply, but I guess we will see. I'm going to bring my pump, but I'm setting low expectations and wouldn't be shocked if I just totally dried right up. It's fine. I probably won't write a whole post about where I am with all of that, but long story short is I've cut down to pumping 1x a day at work, and I get about 2 ounces total. Total. Ouch. When this happened with R I was sobbing every day about it, but thank goodness I'm not that emotional this time. I just find it extremely annoying. If you are reading this and pumping hates you too, take comfort in knowing you aren't alone! If you are looking for something easy to grab for breakfast on the go, check these out. This is not at all sponsored, but if they reached out to send me free ones I would not be sad about it. My mom got me hooked on these and they are yummy! I hate everything coconut, but weirdly I find this flavor the best. I picked up an Aldi brand version a few weeks ago, but they were not as good as the name brand. I still love you, Aldi! I obviously don't eat a package every day, but they are handy to have around in times of desperate need. Mornings can get nuts around here. If you don't follow my blog on Facebook, you missed this video last week. This will never stop being funny to me. You know I took a video of R in her chair every month for the first 2 years of her life (here's the 1-12 months video). I can count on 2 fingers the amount of times she fell out. Guys, J falls out almost every month! Poor little guy. But also LOL. The chair blooper video I make of him is going to be amazing. *Please don't judge us. He's fine! Really. I hope you all have a great weekend and that everyone in your house stays happy and healthy! I've been looking for a few cute shirts for spring so I'll definitely need to check out that online store. I hope J feels better soon and you all get some more sleep! Your women's retreat sounds like so much fun! What great timing too - sounds like it's happening during a time when you could use some quiet mama time to reflect! :) And being a working mom with a sick kiddo IS so hard! There's just so many more variables at play :( Glad he is feeling better though! That high fever is scary stuff! I hate to hear he had the flu, that would scare me to death! So glad he is feeling better though. I can definitely say I do not miss the days of baby being sick all of the time. Before you even mentioned the shirt I did notice it in the photo and thought, 'I think I have seen her in that shirt before on here and I love it!!' haha Totally different subject but I am getting a pair of colored pants in my fix coming Saturday and am soooo excited!! I loved yours and requested some! Oh no, sweet Baby J! How heartbreaking. I'm glad he's on the mend and you survived too. You also can rant if you want to rant. It's a legitimate thing to be upset about for sure. That adorable video almost makes me want to join Facebook again. Almost. I’m so sorry J was sick. So tough on everyone. Thankful he’s feeling better and I hope you guys have a low key weekend ahead. glad J is feeling better and glad you had your mother in law to watch him. that top is super cute and i need that sweatshirt in my life.. when it goes on sale, of course. 100% agree about sick kids being one of the hardest parts of being a working mom. We were dealing with that this week, too, and I spent the majority of the week feeling guilty that I was letting everyone down - work, my kids, etc. I wasn't able to do any of my jobs well. Then we had a woman come to our Women in Leadership meeting at work who talked about how we need to learn to let guilt go, and know that we can have it all (not at the same time) and it's OK to not be all things at all times. Your kids aren't going to look back on their childhood and say, "remember that time you went to work when I was sick?" I mean, easier said than done to not feel guilty, but a good reminder that we are one person, doing our best, and deserve credit for that! Nevermind me crying in the back row over here! Hang in there, mama. You're rocking it. Ahh sick weeks are the most stressful. Hang in there, sending healthy resting vibes for the weekend your way! So glad J is on the mend and you all made it though this tough week!! Sorry to get all serious about breakfast here BUT do you find those to be a satisfying breakfast that hold you over a while? It just seems impossible to me and I'm intrigued, but am also tired of packing a ton of snacks every day. THIS IS VERY SERIOUS. I love love love that Spoiler Alert shirt! So funny. Aw, so sorry your little guy was so sick. I'm glad he's back to feeling better. I'm sorry he was so sick! I just cannot believe that he is almost 10 months old. That video of J made me LOSE IT at my desk at work. HAHAHA. I think that's hilariously amazing. I'm glad the little guy is starting to feel better!! I'm so glad I found that online store through you! I love them!! Hahaha oh my! That video of J! If that isn't an epic fall, I dont know what is! Poor little guy. At least his chair is low to the ground. Zoe fell out of the rocking chair in her room once and it is a normal size. I felt horrible but she was fine. Just scared her more than anything. That will be one funny blooper stream to watch if you put them all together. So sorry he was sick. The flu is the worst! Glad he is on the mend. Did R manage to stay flu free? Oh my goodness! The flu! No! I am so sorry you guys had to deal with that. Poor J. And poor Mama. I'm so glad he's feeling better! And I'm so glad that you are in such a better place mentally and emotionally with pumping this time around. I hope the retreat is such a blessing to you! UGH! The flu is evil. I'm glad J is doing better. Dave treated so many people for it this year and they said it will continue into May. So annoying! I am so sorry! I'm so glad he's feeling better, but it's the worst to see them sick like that. Hope this week is much better for you, friend! I don't think it's annoying that you talk about being a working mom. AT ALL. So don't apologize for that! Definitely put those teething toys in my shopping cart. Anna's already starting I think (4 months - whhhhhy) and I would prefer she not teeth on me. Everything we have seems to be way too big for her mouth. These look perfect! Also, I read your book recommendations in the previous post, and wrote this really long comment, but there was some sort of glitch and I lost everything I wrote. SO to summarize: going to look into that one on social media/tech from a Christian perspective. Glad J is feeling better - it's the worst when they aren't feeling well and don't know why. That shirt is adorable! I love it! You are right, those Belvita things are the BEST! I haven't tried the coconut flavor so I'll have to look for them next!